Apple Inc. was found by Steve Jobs, Steve Wozniak, and Ronald Wayne on April 1, 1976 in Cupertino, CA. The company was originally named Apple Computer Inc. but that was changed to Apple Inc. on January 9, 2007 to reflect the ongoing expansion into the market. In the early years at Apple, the first computer made was the Apple I. This computer only consisted of a motherboard, cpu, ram, and basic textual-video chips. The Apple I was first shown to the general public during the Homebrew Computer Club. In July 1976, the Apple I was marketed at $666.66 which is $2548 when adjusted for inflation for 2010. Apple was then incorporated in January 3, 1977 but without Ronald Wayne, who sold his shares back to Jobs and Wozniak for $800. In April 16,1977 the Apple II was introduced at the West Coast Computer Faire. Between the years 1981 and 1985, the Lisa and Macintosh were in fight for release to the consumer. Lisa won the race to market in 1983 and became the first personal computer sold to the public to have a GUI. Lisa turned out to be a failure due to the high cost of the computer and the limited software availability. In 1984 the Macintosh was finally released to the public. Initial sales were good but follow up sales weren't very strong due to the high cost of the computer as well as the limited software that the Lisa suffered through. In 1985, a power struggle arisen between Steve Jobs and CEO John Sculley, who was hired two years prior. The Apple Board of Directors told John Sculley to contain jobs from launching expensive initial ventures into untested products. Rather than submitting to Sculley, Jobs retaliated by trying to oust Sculley out of his position at Apple. Sculley found out that Jobs was trying to overthrow him and immediately called a meeting with the Board of Directors. The Board sided with Sculley and removed Jobs from his managerial duties. Steven Jobs then resigned and founded the company NeXT Inc. in the same year. The Apple Portable was released in 1989, but was considered to be too bulky. In 1991, Apple released the Powerbook after learning the mistakes they had made with the Apple Portable. In the years 1994-1997, Apple was trying to reinvent itself in the computer market. They decided to team up with IBM and Motorola creating the AIM Alliance. This move was to couple Apple's operating system with IBM and Motorola Hardware in attempt to leave the PC far behind, thus countering Microsoft. In the same year, Apple released the Power Macintosh which was the first of many Apple computers using IBM's PowerPC Processor. After changing CEOs in 1996 to Gil Amelio, Amelio made big changes to Apple including massive layoffs. After many failed attempts to improve Mac OS, Amelio decided to purchas NeXT for their NeXTSTEP operating system. In turn, this brought back Steve Jobs to be advisor to Apple. In July 9, 1997, Amelio was ousted by the Apple Board of Directors for a three year record lows in stock prices and crippling financial losses. Steve Jobs then became Apple's Interim CEO after Amelio's ousting. On November 10, 1997, Apple introduced the Apple Store as well as a build-to-order manufacturing strategy. In the years from 1998-2005, Apple began returning to profitability. Apple introduced the iMac on August 15, 1998 which was designed by the team led by Jonathan Ive. The iMac had a unique design as well as modern technology. The iMac sold close to 800,000 units within its first five months. After several years of development, Apple released Mac OS X on March 24, 2001, which was based on NeXT's OPENSTEP and BSD Unix. On May 19. 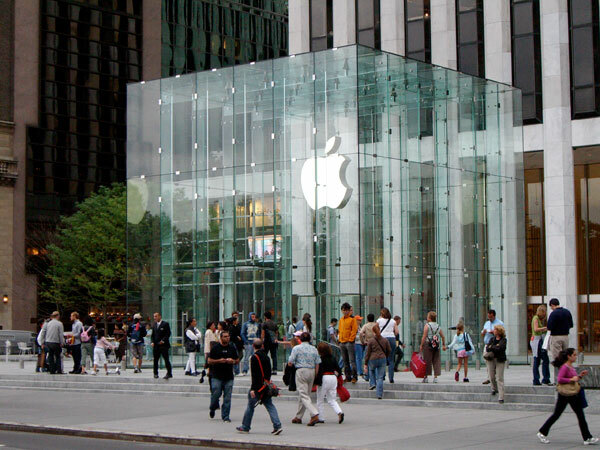 2001, Apple introduced the first official Apple Retail Stores in Virginia and California. The same year, Apple introduced the iPod. In 2003, Apple introduced the iTunes Music Store which turned out to be a huge success. The iTunes Music Store had very tight integration with Apple's iPod music player. In 2001, Apple began transitioning away from translucent colored plastics that were first used in the iMac G3. This led onto the production of the Titanium Powerbook, the polycarbonate iBook, and the flat panel iMac. In the years 2005-2007, Apple began the transition away from PowerPC processors to Intel processors. In June 6, 2005, Apple announced at WWDC that it would begin producing Intel-based Mac computers in 2006. On January 10, 2006, the new Macbook Pro and iMac became the first Apple computers to use Intel's Core Duo processors. By August 7, 2006, Apple had transitioned its whole Mac computer lineup to the Intel processors which was one year earlier than first predicted. The timeframe 2007-Present time is considered the Mobile Consumer Electronics Era for Apple. On January 9, 2007, Apple announced at Macworld Expo that it was changing its name from Apple Computer Inc. to Apple Inc. due to their shift into other tech fields. At this same event Apple announced the iPhone as well as the Apple TV. The following year, Apple introduced the App store for their iOS devices. This turned out to be a massive success which skyrocketed Apple's popularity. When the iPhone was first introduced, it was a game changer for the market. The iPhone introduced the first full touchscreen device that was using the capacitive touchscreen technology as past devices used resistive touch. It also introduced a very user friendly intuitive user interface which made it a hit amongst consumers. Apple also introduced the first touchscreen music player the iPod Touch. This was a dramatic change from previous iPod lineups due to it incorporating a touch screen and basing it on the iPhone's operating system iOS. Apple introduced the iPad on January 27, 2010 to reinvent the tablet market. Skeptics thought the iPad was going to fail due to the failure of tablet PCs that were introduced in the previous years by PC makers. To their amazement, the iPad took off in sales and became a huge success. Apple has now been setting the mobile industry into an innovation frenzy. With other companies trying to play catch up and trying to take down Apple's rain with the iPhone and the iPad, this is creating great competition amongst the companies which further innovation for the mobile market. Due to all the innovation that Apple has forced upon other companies because of their products, Android has developed quickly and storming the mobile market. Android is not as mature as iOS but Android is quickly catching up in terms of ease of use, functionality, features, and apps. Other companies are trying to innovate as best as possible and is now setting the mobile market on fire with new phones, tablets, and even computers. pple has now been setting the mobile industry into an innovation frenzy. With other companies trying to play catch up and trying to take down Apple's rain with the iPhone and the iPad, this is creating great competition amongst the companies which further innovation for the mobile market. Due to all the innovation that Apple has forced upon other companies because of their products, Android has developed quickly and storming the mobile market. Android is not as mature as iOS but Android is quickly catching up in terms of ease of use, functionality, features, and apps. Other companies are trying to innovate as best as possible and is now setting the mobile market on fire with new phones, tablets, and even computers.